Ever wanted to imitate those dishes you enjoyed while eating out for much cheaper at home? I do. I do this all the time, I taste something, then I go home, imitate it and try to make it healthier. This book comes from a fellow blogger, Stephanie Manley of copykat.com, who has had so much success in food imitation she has filled a second book of recipes. I’m a sucker for a great icon guide, this one indicates recipes for cocktail parties, vegetarian, make ahead (always great for dinner parties or freezer cooking), impress the guest (really who wouldn’t want to? ), dinner for one (which happens around here a bit), and dinner for two (which happens a lot around here happily) just to name a few. There are so many tantalizing tidbits in there. The thing I love about this book for people like myself who are trying to eat healthier is, now that you have the recipe, it is so much easier to make substitutions. Want that cheesy goodness that comes from Logan’s Roadhouse loaded potato skins? Flip to page 32, substitute light sour cream, light cheddar and monterey jack cheese, and light butter. You are in tasty heaven and for less fat and calories than eating out in the first place. I love to do take out from home. It is always, cheaper, healthier, and often faster (consider driving time, ordering, etc). What about the Melting Pot’s Wisconsin Trio Fondue? Yeah, it’s in there…you know what to do. I do not have access to a lot of these restaurants, being Canadian, so a book like this adds extra excitement. Many a time my husband and I have been watching tv and seen commercials for places like Sonic, Panda Express, Red Lobster (we don’t have one on the island), and Cheesecake Factory (that is actually due to all our Big Bang Theory watching), they look so good but are nowhere near here. Happily they all have recipes in this book, I can’t wait to make some of those red lobster biscuits, healthy version of course. So many great restaurant recipes are represented in this book including my own addiction, a version of starbucks pumpkin spice latte which I get to share with you right now! Perfect timing too right? Bring water, nutmeg, cinnamon, and ginger to a boil in a medium saucepan. Turn down the heat and simmer for 20 minutes. Strain through a coffee filter. You want the seasoned water to be free of the spices. Pour the strained water back into the pan and add the sugar and pumpkin. Mix well. Simmer another 10 minutes. Makes approximately 1 pint of pumpkin spice syrup. Store in and airtight container in the fridge. Will stay fresh for up to a week. Brew a 4 ounce serving of espresso or strong coffee. Place 2-3 tblsp of pumpkin syrup in a coffee cup and add coffee. Gently pour the frothed milk over the coffee and gently stir. Top with whipped cream and a dash of nutmeg if desired. Want to make it a skinny pumpkin latte like I do? Substitute the sugar with stevia or splenda, choose skim milk or unsweetened almond milk, and skip the whipped cream. A skinny pumpkin spice latte serving (with unsweetened almond milk) comes in at 28 calories, 2 grams fat, 5.4 grams carbs, 1.2 grams fibre, and .9 gram protein. Nummy! I make this with organic canned pumpkin and stevia. Watch for sales throughout the year and enjoy! So, we are having a marathon of various Halloween films tonight. Popcorn, check. Chicken poutine of not so naughtiness, check. Something sweet…hmmm…well obviously it needs to contain pumpkin! I’ve definitely been on a pumpkin kick this season. It helps that it is filled with fibre and tasty goodness ofcourse. 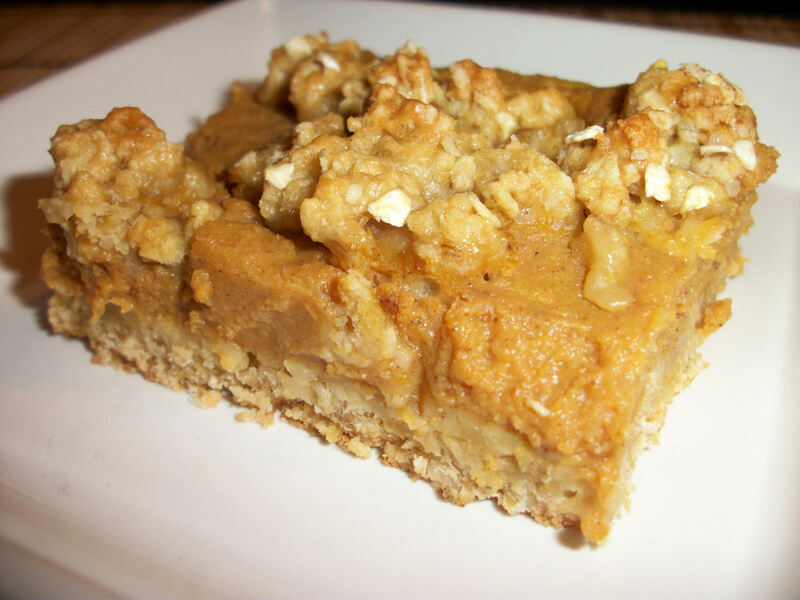 Well, we love date squares so I figured I’d modify the date square idea for pumpkins and tada! It works! Numly marathon food achieved. Combine the crumble ingredients until the mixture forms several lumps and no loose flour and oats remain. Reserve 1 cup of crumble for topping. Pour remaining crumble into a 9×13 pan and press to form a crust that covers the bottom. Bake at 375F for 10 minutes. Combine filling ingredients until smooth. Spread over baked crust. You do not have to wait for it to cool. Top with reserved crumble sprinkled. Bake at 375F for 25 minutes. Allow to cool and cut. Makes 18 servings. Each serving contains 103 calories, 2.1 grams fat and 1.2 grams fibre. They are oh so nummy! If you like pumpkin pie you will definitely love these. They make enough to share too….if you are so inclined. hehe. It’s definitely been a cookies kind of week. I put these together using some leftover pumpkin from a batch of pumpkin cheesecake muffins. Can’t let good pumpkin go to waste now can we? I love fall cooking. Yes, I have justified having one with my breakfast on occasion simply because of its pumpkin content…don’t judge me monkey. Combine the sugar, applesauce, and vanilla until well mixed. Stir in the pumpkin. Add the flour, baking soda, baking powder, and spice. Using a teaspoon drop the mix unto a baking sheet. Bake at 350F for 20-22 minutes. Makes 46 cookies. 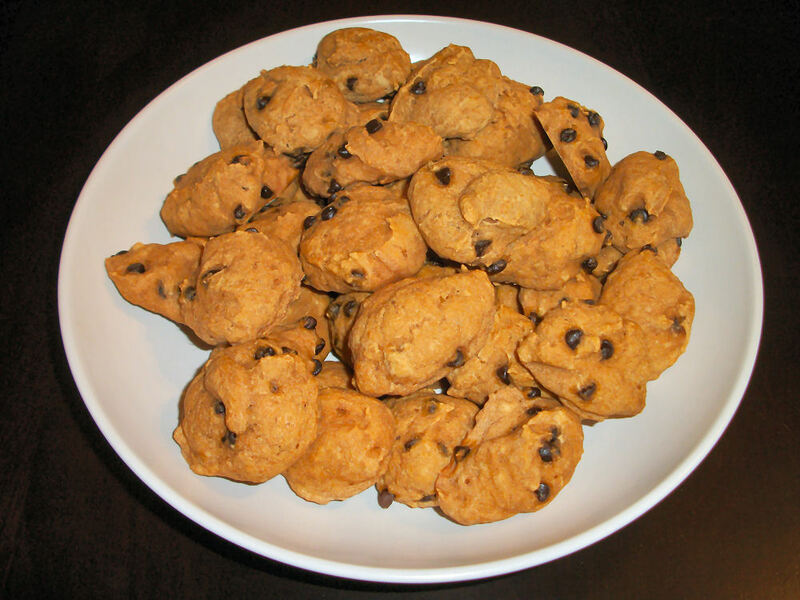 Each cookie contains 34 calories, .4 grams of fat, and .4 grams of fibre. These are such a light and cake-like cookie. Pumpkin and chocolate were made to go together! Seeing those pumpkins in the fields as I drive to agility training or in the supermarket really gets you in the mood to make more things with pumpkin. Sure, I have a pumpkin cheesecake that I loooove to make. This time I wanted something simple to make the day before as part of our thanksgiving feast. So why not a muffin with some of that cheesecake goodness? Oh yes, and good it was. They did not survive…12 muffins were gruesomely consumed at the scene of the crime. Combine the cheese and 1 tbl of sugar. Set aside. Mix the eggs, pumpkin, milk, applesauce, and sugar together. Add the flour, baking powder, salt, and pumpkin spice. Combine until just moistened. Fill your muffin cups 2/3 full of the batter. 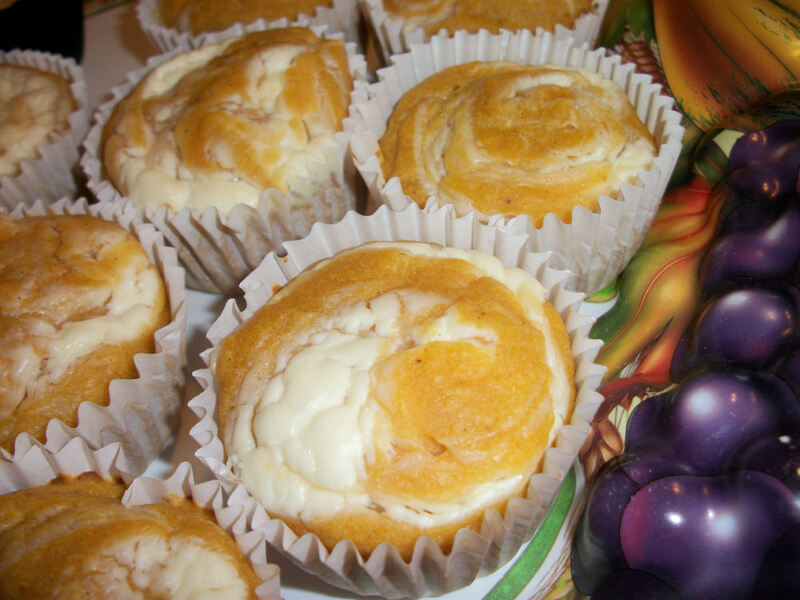 Top each muffin cup with approximately 1 tsp of the cheese mixture. Swirl the cheese into the batter using a knife. Bake at 400F for 20-25 minutes. Remove from pan and cool. Makes 12 muffins. Each muffin contains 90 calories, 1.9 grams of fat, and .8grams of fibre. These are best freshly baked. Sure, no one complains eating them the day after but the biggest omnomnoms came from the day they were baked. Enjoy! I love those wendy’s frosties. I have made chocolate versions like it but decided there must be a way to get a serving of vegetable in along with this tasty treat. Behold! There is. I love pumpkin pie, I love frosties, it’s totally win win! Yes, that totally is a Lord of the Rings goblet. I love that thing. This recipe actually makes more than will fit in this goblet. I recommend a nice big cup for yours! 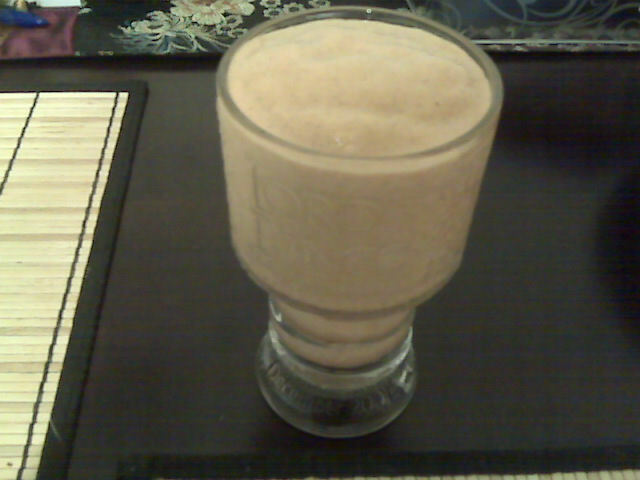 Throw it all in a blender and puree until smooth. This is indeed a frosty drink. Great on those warm summer days or anytime you need to fill that creamy frosty craving. I tend to say its one serving…it’s definitely one large serving, 175 calories, 1 gram of fat, and 3.8 grams of dietary fiber. Sure you can share and cut all that in half but…do you really want to? Don’t forget! This has a serving of veggie in it…and it will keep you full for quite some time. Enjoy!